The madness begins with Spike's pursuit of Specter and a ton of zany monkeys intent on changing the world. The monkeys are on the loose and they must be stopped! Utilizing the PSP's Wi-Fi feature, challenge your friends to thrilling mini-games like snowboarding, boxing, racing and ping pong, anytime, anywhere. 06-16-2017 silverbow Box Text MONKEY MADNESS! The madness begins with Spike's pursuit of Specter and a ton of zany monkeys intent on changing the world. The monkeys are on the loose and they must be stopped! Utilizing the PSP's Wi-Fi feature, challenge your friends to thrilling mini-games like snowboarding, boxing, racing and ping pong, anytime, anywhere. 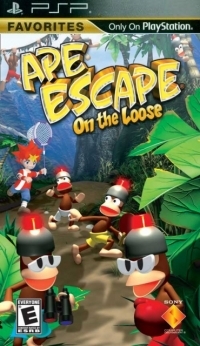 This is a list of VGCollect users who have Ape Escape: On The Loose - Favorites in their Collection. This is a list of VGCollect users who have Ape Escape: On The Loose - Favorites in their Sell List. 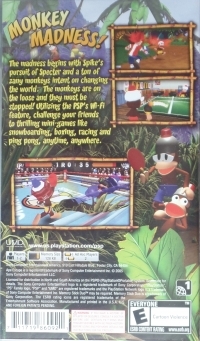 This is a list of VGCollect users who have Ape Escape: On The Loose - Favorites in their Wish List.